Learn About Foods That Fight Cancer! 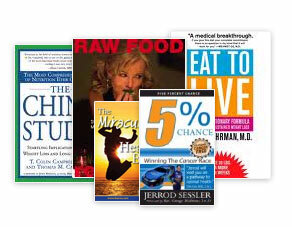 After being given a five percent chance of surviving advanced-stage melanoma skin cancer, author and speaker Jerrod Sessler decided to take responsibility not only for his recovery but for his health as well. Jerrod's story is a riveting message of hope and healing that will inspire you. His delivery is full of energy and enthusiasm for the health message that has become his passion, a message that he says is very basic but much obscured by our culture. 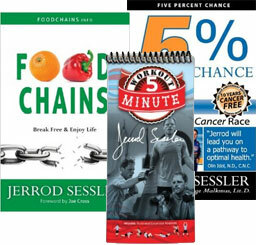 Jerrod Top 10 Kit including "Five Percent Chance", his favorite recipe book, China Study, Eat To Live & more!